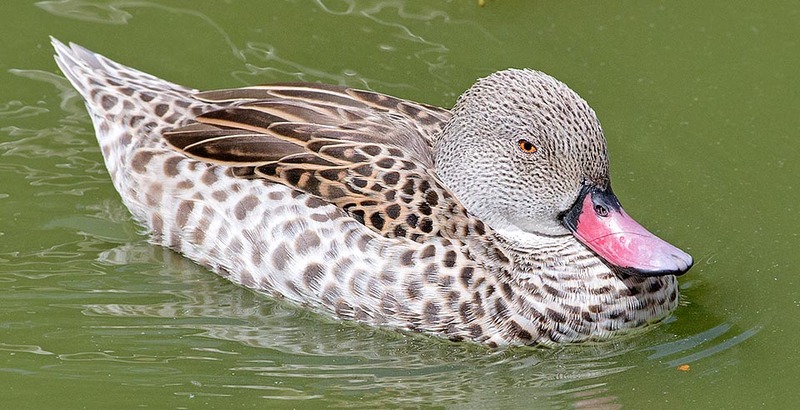 The Cape teal, called also Cape widgeon or Pink-billed duck (Anas capensis Gmelin, 1789), is a small tropical African nice looking duck belonging to the order of the Anseriforms (Anseriformes), to the family of the Anatids (Anatidae), to the genus Anas and to the species Anas capensis. The name of the genus Anas comes from the Latin terms “anas, anatis”, that simply mean duck; the name of the species capensis comes from the Cape of Good Hope in South Africa, with clear reference to the origin zone of this species. The Cape teals are native to a vast area of central-south Africa. They have a “leopard spots” distribution; present in scarce number in most of the distribution range, they may be locally numerous. Abundant in Mozambique and in the KwaZulu-Natal, the greatest concentrations are located in the south. Northward, these ducks, are rare in western and eastern Africa; it’s a species common in Ethiopia and in the alkaline lakes of the Rift Valley. The primary habitat of this species is formed by small basins of salt or brackish water, shallow and without emerging vegetation or with presence of reeds, arid ambients and lagoons along the coasts or estuaries of rivers. In these “geographical map” territories, the pale colouration of these ducks very well blends with the frequented habitat. Essentially plains species, the Cape teal may reach the 1500-1700 metres of altitude in eastern Africa in the Rift Valley. 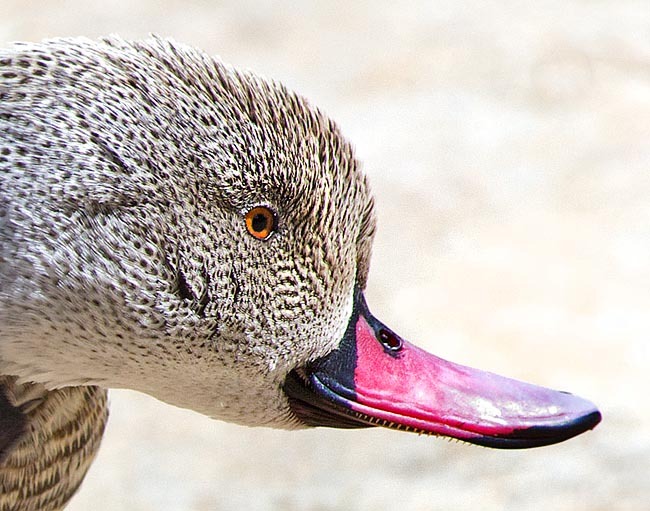 This duck distinguishes for having, proportionally to its size, a rather showy bill for the size (long) as well as for the colouration: pink, stronger at the base (sometimes almost red), with black junction and tip; and finally also the concave shape with the tip bent up. It is one of the smallest ducks belonging to its genus (Anas); its medium length is of 35-46 cm and the weight is of about 315-500 g.
It has a pale greyish-leather coloured livery maculated of brown that, in particular expositions of light, renders it very clear, almost white. On the back, the coverts are brown with yellowish edge. The excited males show a rudimentary shaggy tuft and a sort of nuchal mane that combined with a high and rounded front confer this duck a roundish-bulbous look. The Cape teals present metallic and bright green and black specula, amply bordered of white; these colourful specula are particularly evident when the ducks are flying or when the male effects a sort of semicircular dance while in water. The rest of the wing is of more homogeneous brown-dark brown colour; also the under wing is brown with white portions of the secondary remiges. The legs are grey more or less orange “contaminated”. The sexes are similar: the males differ, besides having slightly bigger size, for the tuft, the mane and the orange-brilliant red eyes. In the females the eyes are orange-brown, they have small manes, their bill is more opaque, and have smaller size with slightly less bright livery. 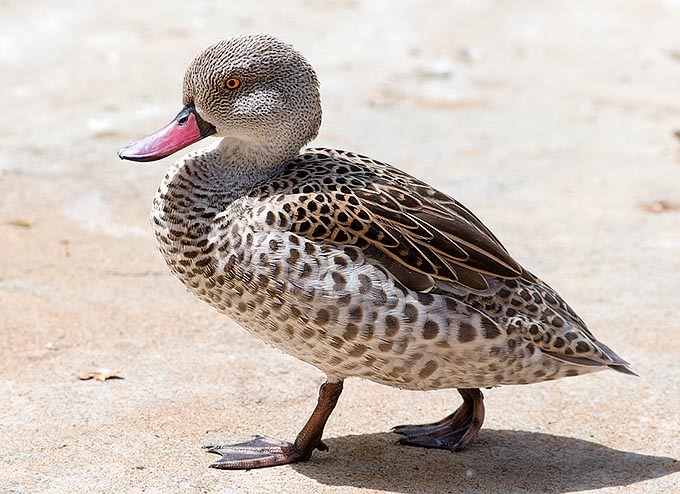 The Cape teal is not particularly timid; if disturbed, dives and swims underwater or flies in long circular progressive ascensions over the water before getting down to perch in the offing. In spite of this, it swims floating high on the water always vigilant and alert and moving the head up and down. These ducks have an agile and fast flight, characterized by rotating gaits. Of mainly crepuscular-night habits, these calm ducks, live in pair or in small groups (3-7 specimens), gathering sometimes in flocks during the molting when even various hundreds of individuals may gather in primary aquatic areas. Even if of mainly sedentary habits, these ducks can become rather nomadic and errant during the drought periods thus performing complicated trips on large distances taking them well out from the usual locations reached with the customary movements. This species plunges more easily than many other surface ducks. The long lamellae of the bill indicate that these ducks feed mainly by filtering and sieving. Perhaps because of the fact of being a duck that often plunges, its bill is bent upwards resembling that of the pochards (Aythya spp.). About the eighty (and more) per cent of their diet is carnivorous being formed by small preys such as aquatic insects, larvae, crustaceans and tadpoles. The rest of the alimentation is formed by vegetal essences. 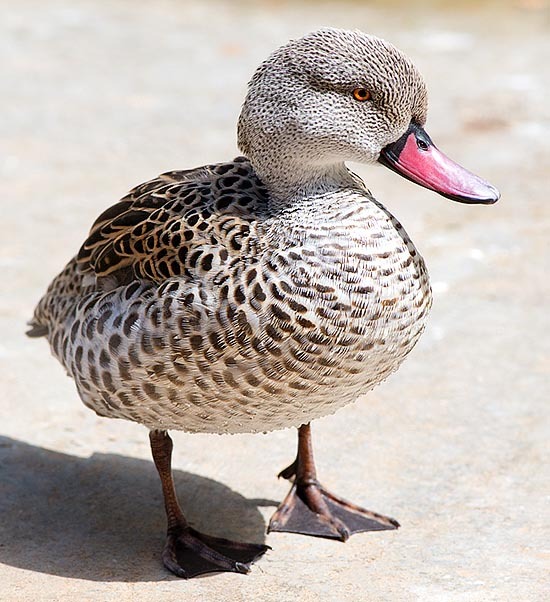 The Cape teal spends a lot of time idling on the ground along the shores of the lakes or of the water extents it frequents. The males, rather silent, emit hoarse whispers resembling nasal squeaks, and, during the courting, shrill whistling noises; the female emits some “qua-quack” nasal too. The pairs often perform sort of simultaneous strutting dances. The Cape teal reproduces in an irregular and opportunistic way during the whole year in the periods when the conditions become suitable even if the nidifications are usually most important between March and May. The reproduction is stimulated by seasonal sporadic rains creating flooded areas. The pair bonds are very strong, perhaps permanent, and is probably related to the need that the pairs must be ready for the reproduction in whatever period taking advantage of unforeseeable short temporary environments suitable for the nidification and consequent breeding of the progeny.. The nests are hidden under spiny bushes or under vegetation of other type that protect and hide them; usually, they are located on small islands and in any case not far from the water. In case of banks with thick vegetation, may be evident the narrow tunnels of passage to and from the nest. The hatching is usually formed by 6-8 (4-13) white-cream eggs, incubated for about 25-27 days by the female. The ducklings have brown-dark brown, yellow shaded colouration. The males participate actively to the care of the young, and may be rightly for this, the neonatal mortality appears to be low. The hatchings may merge in nurseries. The young reach the independence usually little before the two months of age. This species seems not to be endangered; it is estimated that various tens of thousand of individuals do live in eastern Africa and the same number in South Africa where the number of specimens appears increased during the last years probably thanks to the exploitation of the continuously increasing artificial water bodies. It well adapts to captivity where it easily reproduces in various months of the year; the parents are much protective in respect to the progeny that is energically defended against birds of prey even if much bigger than their own size, like gulls or herons. Also for the range of interesting behaviors manifested, this duck should be more diffused in the amateur breading; its life expectancy may get close to the twenty years.